I've never heard of a baked yoghurt tart before but when I read it was similar to a custard tart I got very excited! I love a classic custard tart (as I've made before here) but I'm always looking for healthier options. A tart filling based on natural yoghurt and flavoured with vanilla, fruit and almonds sounded perfect. Fresh berries are ridiculously expensive here, even in season, so I chose to use frozen cherries instead. I thawed, drained and patted them dry before using and they worked really well. I also opted for a different crust. I found someone else's version of this yoghurt tart here and they had used an oatmeal crust which sounded delicious so that's what I used. I made it fructose-free by using dextrose instead of brown sugar. It was more like a cheesecake base than a tart base and I loved it. In fact it could become by go-to cheesecake base instead of biscuit crumbs! I'm going to blame my oven but this took more than double the stated time to cook, 1 hr 10 mins as opposed to 35-40 minutes. We loved this! Much more similar in texture to a cheesecake than a custard tart. Which makes it even more of a winner in my book because I adore cheesecake! 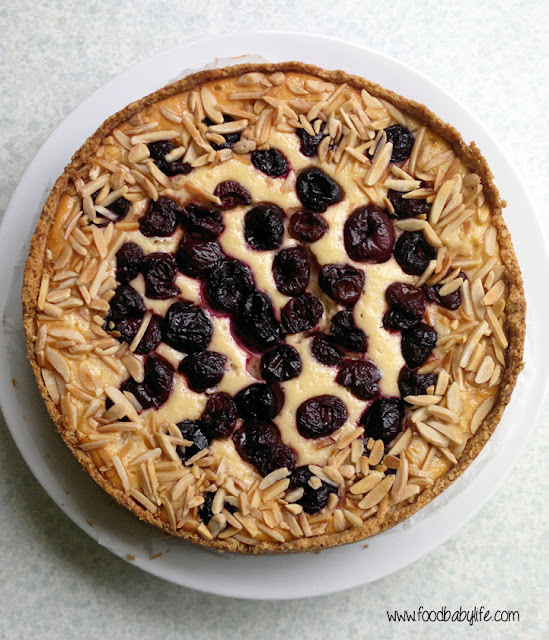 I loved the nuttiness of the base with the almonds and cherries, and the filling was smooth and only slightly tangy. Just delightful. The recipe is available online (just google Julia Child Baked Yoghurt Tart) but I have included the recipe for the crust here. Click on the link below for the orginal recipe made on brown sugar. Lightly grease a 9 inch springform pan and line the base with non-stick paper. Place all the dry ingredients in a food processor and blitz until the oats are finely chopped. Add the melted butter and egg yolk and process until combined. It should resemble damp sand and stick together when pressed. Tip the mixture into the prepared tin and press evenly over the base and halfway up the sides. Chill for 30 minutes. Place the pan on a baking sheet and blind bake at 170 degrees C / 150 C fan-forced for about 20 minutes, then remove the pastry weights and bake uncovered for another 10 minutes. (I put foil around the edges which were starting to get a little dark. Cool to room temperature before filling. 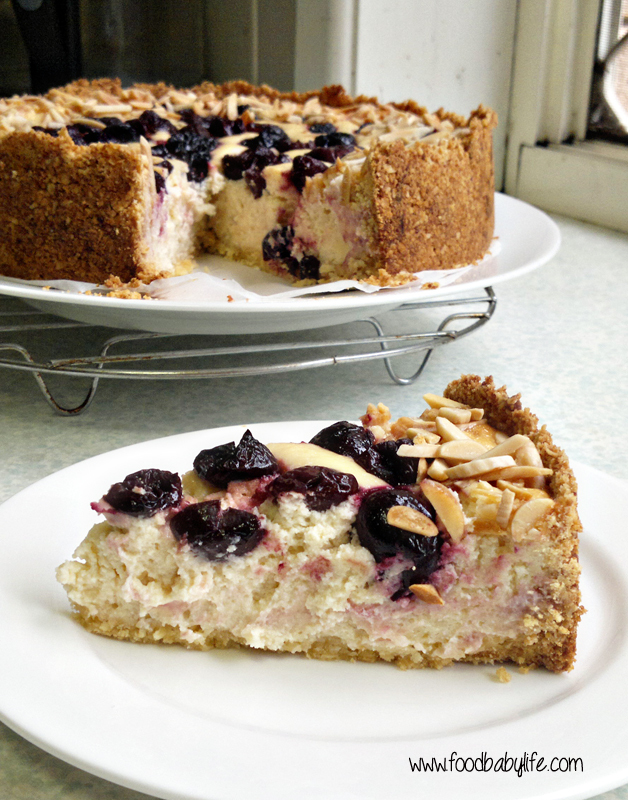 I love the idea of an oatmeal crust...and your cherries look like a delicious topping! Ahh! After tasting this,I thought the pastry seemed out of place and that an oatmeal crust would be more suitable! Looks like you had the same idea - beautiful tart! Your tart looks gorgeous and so creamy. Thanks for posting the recipe for the oatmeal crust. While I enjoyed the tart, I kept thinking that since we use non-fat yogurt, the recipe could be further adapted to be healthier and still delicious. Oh that oatmeal crust sounds delectable…I have to make a copy of that one. Your tart looks wonderful…love the cherries! Beautiful tart! I loved this baked yogurt. I like cheesecake, but find it a rich dessert, so was pleased with how this one seemed like a cheesecake. Love your oatmeal crust...I am going to have to try that as it seems healthier (by a lot)!! Great job! The oatmeal crust is brilliant. Love the cherry addition. Your tart looks perfect! The oatmeal crust looks and sounds delicious - good call on that one!